Home » Adventure » The Seed of a Non-GMO Movement. The Seed of a Non-GMO Movement. Sierra Pizza is on the forefront of what is hoped to be a local movement towards organic, GMO-free food. When you think of organic, non-GMO food, the first things that probably come to mind are dilapidated salads, expensive prices, and maybe a couple o’ hippies in a burning man cart. What you probably don’t think of is the local pizza spot that you stop into for a pint and a pie after your softball game. 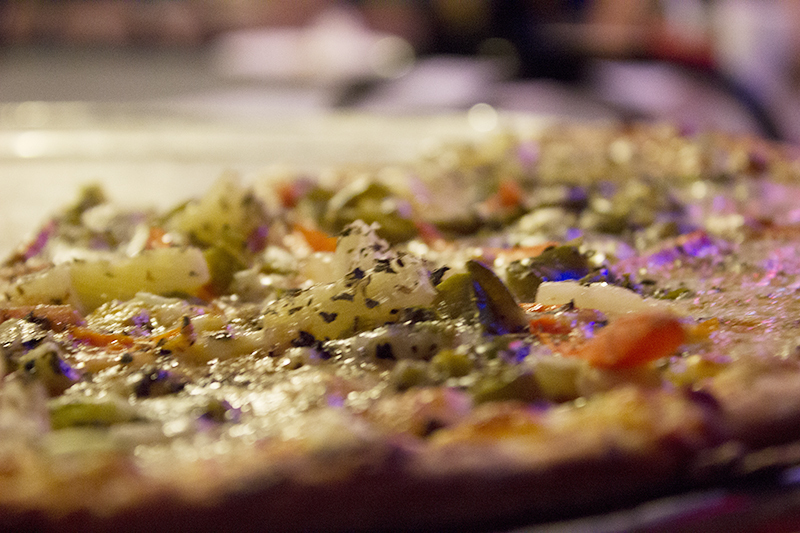 Well, welcome to Sierra Pizza, an unlikely mover and shaker on the local non-GMO front. The restaurant’s goal is to eventually shed all GMOs from their menu—a process that has been no easy feat thus far. So why the big change? To really understand what makes this spot tick, you have to know the owner. Meet Reek, a.k.a. Richard Ellis. The first thing you notice about him is his boundless energy. The man radiates passion, and if you get him started on the topic of organics and GMOs then you’re bound to get blasted with information. Whether it’s the latest TED talk he’s watched, or article he’s read, or book he’s perused, the man is armed and loaded with knowledge. So much knowledge, in fact, that he simply hasn’t had the time to file the information away in his brain. He tosses out the facts so rapidly and in such random order that it can leave you dizzy. The thing is, Reek wants change. He wants it so badly you can taste it for him. It all started at home, when he made the decision to switch to organic and non-GMO ingredients after he noticed they had a tendency to disrupt his stomach. Once he fully transitioned over to wholesome foods at home, he was faced with a new conundrum. Why serve food in your restaurant that you yourself wouldn’t eat at home? And thus, a new menu was introduced. Or rather, the same menu was reintroduced—with GMO-free ingredients. So what’s up with this explosive no-GMO movement as of late? It’s not like our parents ever talked about it when we were kids. Now GMOs are being taken to the guillotine for its beheading much in the same way trans fat, gluten, and aspertame have in the past. No doubt upon its demise GMOs will be shelved among the rest of those scarlet bearing nutritional no-nos. Perhaps to understand the picket against GMOs, one must first understand GMOs. GMO stands for genetically modified organisms—essentially any food that has been artificially manipulated in a laboratory in ways that don’t occur in nature. The long-term effects of GMOs remains largely unexplored, so whether or not they cause health problems such as cancer remains undetermined. What can be ascertained, however, is GMO crops require more herbicide and pesticide, which means potentially more chemicals in our system. Either way, you’re going to be hard pressed to convince the health-conscious into consuming that which doesn’t occur in nature. Hence, the latest nation-wide movement against GMOs. So will Tahoe be jumping on the bandwagon? Reek is hoping so, and has already begun to pave the way. 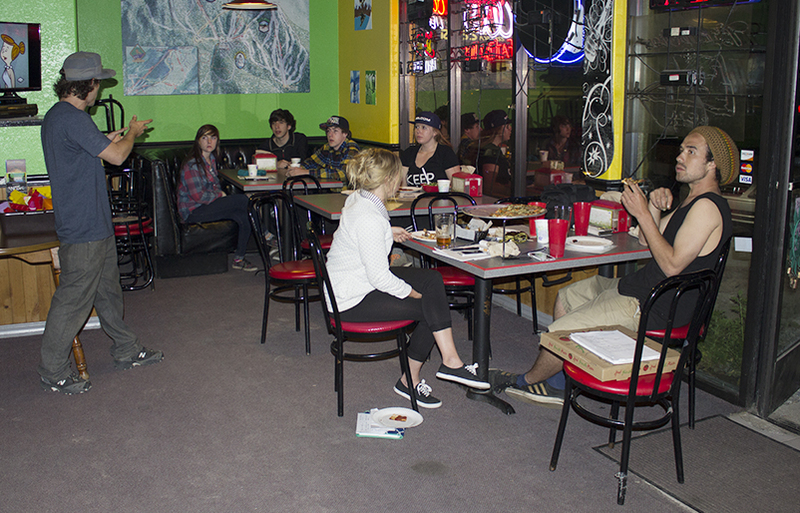 Reek hosting a community open panel discussion at Sierra Pizza. Making the switch, however, has come with it’s own set of obstacles. Reek’s intention is not to create a competitive advantage by being one of the few restaurants to offer organic, non-GMO options. Rather, his hope is to be on the forefront of a local movement so that other restaurants can take his lead in increasing awareness and offering natural ingredients. It appears a few other establishments in town have been perking up to the idea as well. According to a recent article published by the Trib, Himmel Haus has been making efforts towards jumping on the sustainablity wagon, with a long term goal of organically growing their own meat and vegetables. Another local cafe, Simple Bliss, promises all organic, non-GMO, sustainable ingredients on their menu. So while South Lake may not be on San Francisco’s level of non-GMO hipness, it’s safe to say the seed has been planted. How much or quickly our community is willing to water the idea will certainly depend on a variety of factors.We are a health -conscious town, but when it comes to dolla’ dolla’ bills, well, let’s just say our wallets aren’t brimming with them in the same manner as the Bay Area. And let’s be honest, organic/GMO-free food breaks the bank. Fortunately, Reek has already addressed that factor. His hope is that as this movement becomes increasingly popular, so will the accessibility and affordability of commercial GMO-free ingredients. However, as the quote that opened the article points out, it will take banding together to make real change happen. Reek has also pointed out that it’s important for people to do their own research so that they can come up with their own opinions. Granted, Tahoe may be off to a slow start, but the hope is locals, along with the nation, will develop a greater interest in their nutrition and health.